When you support PlayTime you help ensure our children have access to positive, life-enriching experiences. It is critical for youth, the thought-leaders of tomorrow, to be immersed in a robust, artistic, and cultural environment throughout their developmental years. The 21st century demands flexible and innovative thinkers; arts organizations like PTP prep children for new perspectives and ideas that develop stronger social bonds within communities. Research studies confirm the many benefits of exposing children to arts and culture: children who participate in arts programs and cultural activities earn higher grades and test scores and go farther in school. Kindergartners who visit cultural organizations, even if it’s just once, have higher achievement scores by 3rd grade, no matter their socioeconomic status. Children who visit cultural organizations are more likely to vote, be active in their communities and volunteer as adults. But for many of our young people, engaging with the arts outside of the school environment is just not possible. As these opportunities are reduced from school curriculums, families are left to provide these life changing opportunities. Your support to PTP gives the traditionally under served populations of Dane County a chance to enjoy what many of us take for granted. In addition to giving children the invaluable experience of going to the theatre, by supporting PTP you will underscore its importance to the community and to the lives of countless children. Please consider supporting one of Dane County’s most highly respected cultural organizations. We thank you in advance for your thoughtful consideration. Please email us for more information on becoming a corporate sponsor. Your sponsorship will be acknowledged in our promotional materials. 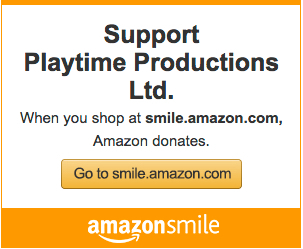 Your logo or company name will be placed prominently on the PlayTime Productions’ Web site. Contributors will receive acknowledgement in the program. Your yearly contribution will grant you distinction as a member of the Director’s Circle. You will be acknowledged as a perennial sustaining contributor, in addition to being acknowledged in your respective contribution level. Alumni gather to sing the curtain call at the 25th Anniversary Celebration, Fall 2011.